Dragons Ladies 1s built on the positives from last week to put in a dominant performance against Wisbech, winning the game 5-0. The hosts, welcoming Joanna Raymond and Holly Setchell back into the squad, opened the game strongly, putting into practice some of the principles they’ve been working on through the preseason. The first half saw some exceptional movement of the ball and patterns of play, as the Dragons put Wisbech under early pressure. The forward line of Katy Hands, Lucy Morton, Tabba Tabrett and Shelly Seaman made it tough for the Wisbech defence as their well-timed runs created plenty of passing options. This paid off within the first 10 minutes as a movement into the circle saw the Dragons win a penalty corner, and Tabba calmly slotted it into the net with a well-practiced drag flick. The rest of the half saw much of the same, with little pressure on the Dragons defence. Just before half time, some nice movement down the right hand side of the pitch from Carmel Windsor-Waite and Tabba Tabrett saw the ball slipped to Liv Thomas on the top of the D and she placed her shot perfectly to drift past the goalkeeper into the bottom left corner. The Dragons maintained the intensity throughout the second half, winning a flurry of short corners and converting two of them through Tabba and Lucy Morton. Another goal came from open play as Shelly Seaman drew the goal keeper out and pulled the ball back for Katy Hands in front of the goal to put the Dragons 5-0 up. Wisbech had a few forays forward in the second half, but they were dealt with coolly by the defensive line, with youngsters Sophie Barrow and Carmel Windsor Waite making some important tackles and interceptions. Joint players of the match were Carmel Windsor-Waite and Liv Thomas, but this was a strong overall team performance and a deserved 3 points. Norwich Dragons traveled across the city for the first local derby of the season on a bright sunny morning. Dragons were pleased to welcome Annabelle Phoenix for her first Dragons league game and Sam Franklin for her first 2’s game this season. The game started a bit nervously with both sides struggling to deal with the pitch conditions. Several balls were missed on the bouncy pitch which made it tough for either team to get into their stride. It was during this period of play that City had their best chance of the game. City were awarded a short corner which Dragons struggled to clear and in the confusion Dragons gave away a second short corner. Second time round Dragons were more clinical and managed to clear the ball. Even though Dragons did not play their best Hockey in the first half they stayed strong in defence with Harriet Green, Sarah Borrett, Karen O’Neill-Simpson and Donna Vaughan making sure they held City at bay with the help of some great saves from keeper Emma Cleland. As a result the score at half time was 0-0 despite a few chances for each side. The call from Hannah (who is unfortunately out injured) was for the Dragons to play with more belief and to stick to our key principles that we have been working on in training. The Dragons started the second half much stronger, with nerves settled and everyone getting used to the pitch, Dragons started to push forwards. The midfield of Gail Thomas, Debs Smith, Annabelle Phoenix and Sam Franklin started to link really well together passing the ball at speed and making it difficult for City to get the ball off them. As a result Dragons forwards, Jess Bennett, Kate McKenna, Lauren Lawrie and Laura Van Den Berg started to see a lot more of the ball and had several good chances and earn several short corners. It was from one of these short corners that Dragons took the lead. The short corner broke down hitting a City players foot, the umpire played advantage as he saw the ball had fallen to Gail Thomas at the top left hand of the ‘D’. Thomas took her chance well and smashed the ball into the goal like a bullet, giving the City keeper little chance. Once ahead Dragons controlled the game and the score finished 0-1. 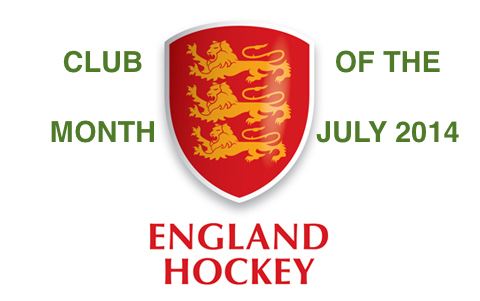 A great start for Norwich dragons 2’s who as of yet haven’t conceded a goal! Several players received votes for player of the match but the most votes went to Donna Vaughan for her great defending. Great thanks to all supporters and to Hannah Hardy for running our sideline. Norwich Dragons Ladies 3rd team hosted North Norfolk 1st team on a warm September Saturday afternoon at The Den for their first home league match and were prepared for a tough game. The match began with North Norfolk maintaining the possession and looking to gain an early advantage from their quick wingers. However, the defence of Grace Brown, Kath Mares, Spike and Hazel Knights, well supported in goal by Kat Speirs maintained their composure and dealt with all the danger. 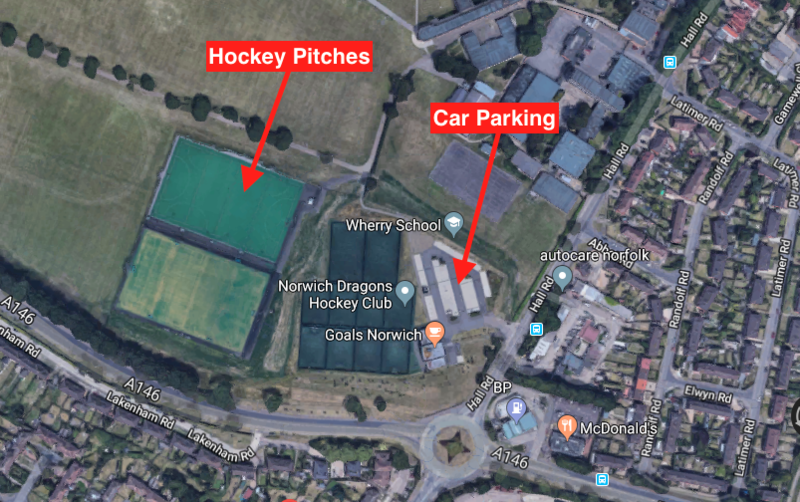 Norwich Dragons began to create some attacking chances following the early pressure from North Norfolk and opened the scoring with a confidently taken strike by Ally Windsor Waite into the bottom left hand corner of the goal. Both teams had short corner and open play chances before the half time whistle but the score remained 1 0 to Dragons at half time. The half time talk called for Dragons to maintain their structure on the pitch and continue the hard work all over the field. The second half was entertaining for the spectators on the sideline with the game going from end to end, with both attacks showing a good array of speed and skills. The Dragons midfield of Harriet Rant, Katie Lister, Elsa Scott and Hannah Ellis worked hard to support the attack and defence. However, North Norfolk managed to level the score halfway through the second half from open play. Dragons maintained belief that they could still score and kept playing attacking hockey with chances being created by the forwards of Jess Haw, Harriet Marlee and Aditi Naik. With ten minutes left on the clock Harriet Marlee made a run down the left wing, along the baseline and passed back for Jess Haw to have a shot saved, the rebound was received by Harriet Rant who shot from the top of the D that was again saved by the keeper, which was collected and fired home from close range by Ally Windsor Waite for Dragons to take the lead again. Following the pattern of the game North Norfolk pressed forward to gain another equaliser and were awarded a short corner on the final whistle. Norwich Dragons managed to clear the shot and maintain the one goal lead and take the 3 points. A great team effort to build on in the next few weeks, with Hazel Knights and Ally Windsor Waite sharing player of the match. It was a sunny late afternoon game at Weybred for the Ladies 4s this week, with surprisingly warm conditions for the time of day. Magpies 4s came out quickly and with intent, scoring within the first five minutes. Rather than getting their heads down, this goal shook Dragons into action, and they started to put the pressure on the Magpies’ defence. Dragons won several short corners in the first half, and despite exploring the full extent of their playbook, the ball just didn’t seem to want to go in the goal. There were a couple of very near misses on each post and credit must go to the Magpies’ keeper who was forced to make some good saves. Finally, at the end of the first half, luck was on the Dragons’ side. Another short corner slipped from Amy Forse to Caroline Wolfe, whose shot was deflected clear by the goalie. Fortunately it was kicked into the path of Fiona Fletcher on the right of the D, who got some air beneath her sweep to get the ball past the keeper and into the bottom left corner of the goal. The equaliser fired up the visitors for the remainder of the match, but sadly the second half ended up being similar to the first. Dragons had many more short corner opportunities, but the Magpies side put on plenty of pressure at the other end too. The home team were very strong, getting low to the ground and stopping any attempts by Dragons’ midfield to carry the ball. At times the Magpies’ passing pace made them look very dangerous, but Dragons managed to close them down and protect their D.
In the last five minutes of the match Dragons were on the back foot, with continuous pressure and a couple of shots being set loose from the Magpie forwards. However Dragons covered well and managed to keep the score to 1-1 at the whistle for that all-important point. Plenty to work on for the Ladies 4s, but some positive signs for the season ahead. A welcome back for Lucy Buxton and Catherine Matthews who brought their usual youth and pace to the team. Catherine also shared player of the match with Lilly Sore. Luckily the final score line did not reflect the score line in my dream from the night before, which if you want to know, resulted in an 8 – 2 loss. Thankfully for us, the real score line was almost the opposite. Phew! From the the starting whistle, Dragons put heavy pressure on the Yarmouth goal seeing a lot of shots on target, which were defended well by the Yarmouth Team. At one point there were 6 consecutive shots on goal, the last being stopped by a foot (not Lizzie’s) on the line. This resulted in the Umpire awarding a penalty flick which Beth Elgood confidently stepped up to take. It was a great flick matched by a great save (one of many) from the Yarmouth keeper. Shortly after we were awarded a short corner. A great injection from Gemma Ballard resulted in a fantastic straight strike and our first goal from Steph Samson. 1-0 up. Dragons inflicted further pressure on the Yarmouth Defence, so much so that Mia Somers even had time to have a little rest (no one saw you sitting down – honest!). The defence worked tirelessly with some great switch arounds between the back line of Stella Windsor Waite, Steph and Emily Smith. Much of the attacking play stemmed from their hard work at the back, getting the ball up to our fab midfield of Chloe Mikronis, Mel Widdows, Kate Hale, Hannah Edwards and Lizzie McDonnell. The second goal came from Jane Wells at 20 minutes from a straight strike at the top of the D, which hit the left post and went in. 2-0. As the half drew to a close, Dragons switched off a little, losing their intensity and allowing Yarmouth a rare break, in which one of their players managed to squeeze the ball in between Mia and the post. 2-1. Luckily 3 minutes later, Lizzie, with another assist found Gemma who made it 3-1. At half time with some useful feedback from Amy (thanks for running the bench) and a target of 10 goals, we went out with more intensity and structure to our game. It paid off. The fourth goal coming after 4 minutes with a long ball across the D to Katie Hale who calmly swept it into goal. 4-1. One minute later saw more great work from Katie (POM), with a shot on target which was saved by the keeper, the rebound being put in by Gemma. 5-1. Two more goals were to follow, both from tenacious midfielder Mel. Again Kate’s distribution of the ball leading up to the goals. 7-1. The Dragon’s relentless force continued with our 8th well deserved goal for Beth, skinning her knees in the process. Further shots continued, with Jane’s high shot being parried away by the Yarmouth keeper’s hand. Our final (well almost final) goal was scored by Lizzie who had worked hard in the D to make the score 9-1 (definitely scored with a stick). It’s safe to say, this was a game dominated by Dragons, with A LOT (Lily counted 19) of short corners going our way. Perhaps the take home is that we need to work more on converting short corners into goals! Nonetheless, a great team effort and a really enjoyable game! Ladies 6s played away to Lowestoft 2s on a slow and sandy pitch. Only playing 3 of last seasons 6s, the new look 6s worked hard to together and as a unit in division 1. Taking the lead through a well worked short corner breakdown, finally put away by Stevie Spencer. Extending that lead with Adelice Kraemer just after half time. Railway upped the pressure on the Dragons defence to concede two late goals. However, this Dragons 6s team showed lots of promise and with each week are growing with confidence and team spirit. With a challenging season ahead, the 6s are ready! Dragons haven’t quite hit their stride yet, and if they needed an excuse it was that four players were suffering from heavy colds/chest infections. Having gone end to end with City for most of the match they tired in the last 10 minutes and City looked the better team with their strong runs. The Dragons squad individually all contributed, but as a team there is some work to be done. Emma ‘Meg’ Dyer was POM with some excellent tackling and blocking and from her position at the back she urged the Dragons to get first to the ball and onto the posts. City’s right forward was a skilful handful but Meg contained most of the threat with Nat Crisp and debutante Bethan Greaves also catching the eye for their defence. Briony Johnstone ran herself into the ground in the centre of defence, despite being under the weather. Maisie Dearmer was full of energy and pace at right mid and Paige Fisher showed some nice touches at left mid. Mia McGhee was also keen to pick up the ball and run with it and got some shots away. Mia came into battle in the centre, and the City keeper blocked her shot for Katy Cole to pounce on the rebound and sweep the ball home. The goal was a sweet reward for Katy who has worked hard on her fitness and ball control to get a chance in the 7s. Her goal brought the score back to 1-2, and despite Sophie James getting onto the post as required, Claire Fairhurst charging in from the left, and Becky Bowen tackling ferociously at the top of the diamond and spreading the passes accurately, Dragons didn’t always have the grittiness to control the midfield and the City attack. City got their goals when Dragons failed to smother them on the edge of the circle, leaving Emma Northie North to face the onslaught. 7s have been practising their penalty corners, though not with everyone in the same place or even on the same night! Doesn’t sound too promising… But with Captain Claire taking responsibility for injecting, she slid an inch-perfect ball to Bridget Le Good who slammed the ball (along the floor) into the far corner to bring the ball back to 2-3. Unfortunately Dragons tired more than City but they have a plan to tackle their areas that need improvement which they will put into practice on Wednesday – colds and sneezes permitting – as they press on for their first win. Captain Lois Metcalfe had very kindly spent much of her free time this week devising a new team formation which proved to be very beneficial and with the chance of a goal within the first 7 minutes had team morale on an all time high, which continued throughout the match. And together with the added help from Mike and Hannah on Wednesday evening, it was clear that the players in defence were armed with a few extra tools to keep the ball out of the oppositions D.
Both Anna’s in defence were quick to clear the ball off the pitch and away from the goal proving to be a simple but very effective technique. Emma ‘Mouse’ Fielding deservedly was awarded man of the match. She fought tirelessly to defend the goal and displayed some text book hockey skills from all the Wednesday night training. We all cheered when she made a perfect block tackle and took possession of the ball!!! New to the team and playing her first match for Dragon 8’s was Izzy Gale, who although confessed to nerves at the start proved to be an invaluable player, making some excellent tackles. Johanne Steward, Sadie Jacobs and Lois had some very near goals and every one of us waited to hear the reassuring klonk of the ball hitting the back of the net. Sadly for us it was not to be today but we certainly all agreed how much we enjoyed the match. Communication was very much in evidence as was team spirit and smiles on faces. Thanks to Shanese Claxton for organising all the subs and diligently keeping her eyes on the timer. Dragons eased to a comfortable win over North Norfolk. Dan Ryan controlled the middle of the pitch with Connor Adams. Man of the match Ryan , help himself to a hat trick whilst fit again Matt Armstrong weighed in with two. The scoring was completed by Andrew Cross, Tommy Gale, Pete Latoy and Lloyd Wade. A new group of Dragons played together for the first time and it showed. The lack of communication early on let the door open for the opposition who took full advantage in the first half. The dragons were down 0-4 going into the sencond. The Dragons team took on the constructive criticism of the half time talk and with better shape and more completed passes held City back and the Dragons were able to push forward. It led to a short corner which was put away by Shiv Kapur after multiple passes within the D. Another late flourish of quick passes allowed Ed Crosier the opportunity to take one last shot at the goal which was put away to bring the final whistle. Dragons won the second half 2-1 to the overall score of 5-2. This entry was posted in Latest News on September 30, 2018 by Comms Manager.